Achatina is a truly unique creatures. 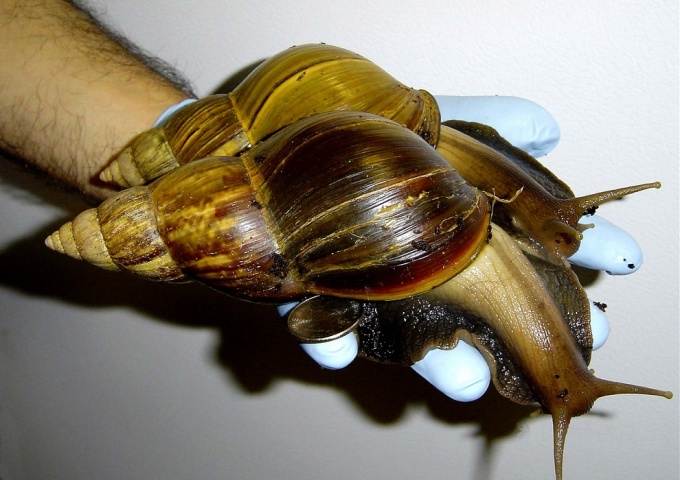 This snail is one of the largest among land molluscs. With the right content at home, can reach a length of 20 cm. Many owners of these snails are interested in the question of how to arrange accommodation for snail Achatina. Shell of Achatina snails have conical, adults from 7 - 9 turns. Shell color depends on what you feed them, hereditary characteristics and other living conditions of the mollusk. This kind of snails does not require a special cage, even the aquarium can take an old, leaky, who was going to throw away, because it will not need to pour the water. The volume you choose at the rate of 10 liters per clam. Also think about what you close dwelling snails, because without a cover on the aquarium, they will travel to your apartment. And don't forget that snails also breathe, if hermetically closed, they suffocate. Ground to bottom it is better to buy at the pet store, for example, for snails will work, coconut substrate. Cover it with layer thickness of approximately 7-10 cm Not suitable as the soil is peat, which is sold in flower shops, as it contains a lot of fertilizers that are harmful to Achatina. Sawdust snails also will not like. But litter, without pine needles, what you need. Just don't forget to boil before placing in the terrarium a little wet, because the soil will create the necessary humidity. Also, the softness of the bedding will save the shell, and, possibly, the animal itself, with an unexpected fall from the walls of the aquarium. In addition, it would be nice to put in the terrarium saucer with water, because the snails love to swim. Observe all the rules of keeping Pets and they will grow you for the joy!